Seven years ago today — July 15th, 2003 — Star Wars: Knights of the Old Republic was released for the original Xbox console. Now, I normally don’t go around spouting off release dates of games; I happened to run across this one a couple days ago only because I am once again playing this game. Since I have been so completely addicted to it in recent days, I thought it might be an appropriate subject for one of those elusive Oddball Update “Retro Gaming” posts. And so here we are. 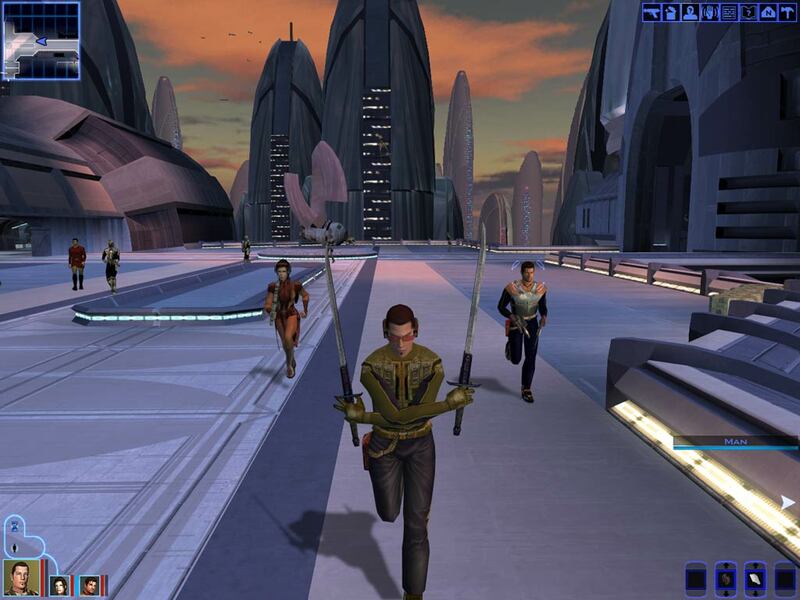 Star Wars: KOTOR (as it shall henceforth be called, since I don’t want to type out that whole name again) has the honor of being the first game I ever reviewed here at Oddball Update. It was, in fact, the subject of my second post ever on this blog. Reading that old post from 2003 is somewhat disorienting today, as it talks about the old Xbox console and its hamfisted controller, and makes comparisons to other games of the era that I have long since forgotten. But the overall bent of the review still holds true: KOTOR is an amazing game, even today in 2010, and now — as then — it’s an absolute pleasure to play. Today’s post won’t really be a review of the game (hence the absence of the word “review” from the already-overlong post title). It’s more a chance for me to discuss the technical fine points of going to back to such old software on a modern computer. This is a process which is typically fraught with compatibility nightmares, driver hacks and other stuff-and-nonsense that makes you wonder why you even bothered in the first place. However, thanks to Valve Software’s inestimably helpful Steam digital delivery platform, playing KOTOR on your PC is now as easy as plopping down $9.99, downloading 4GB of data and firing it right up — natively — on your Windows 7 box. Yep — KOTOR is on Steam. Produced by BioWare, who have more recently been known for that other space opera video game franchise — KOTOR is a role playing game set in George Lucas’ famous Star Wars universe. It tells the epic tale of a Republic soldier whose connection to the Force is more than he (or she) ever expected, and who is thrust into a conflict the likes of which may spell the unraveling of the galaxy. The story is pretty standard RPG fare, really, but the Star Wars setting and typical BioWare spit-and-polish help make it something really special. I already own both KOTOR and KOTOR 2 for the original Xbox console. In fact, my odyssey began last week when I popped the Xbox version of the first game into my Xbox 360. The built-in backwards compatibility software allows the game to run on newer Xboxes, although it’s not without its faults. For a start, KOTOR was a game that pushed the limits of the first Xbox, and because support for it is merely being emulated on the new console, performance suffers greatly. In most of the game’s environments, the frame rate is so poor that any dialog spoken is all choppy and cut off. Comically, dialog also falls behind during cutscenes to the point where actors are interrupted in the middle of a sentence by an overlapping line. And sometimes, the sound effects just cut out completely, requiring the game to be exited and re-started before they will return. Perhaps worst of all — and this isn’t a bug, merely a fact of life — KOTOR really looks like crap on the Xbox 360. It’s not that it looks any worse than it did on the original Xbox, as far as I can tell. It’s just a standard-def game blown up to huge proportions, in a 4:3 pillarboxed presentation no less, on my 57″ screen and that’s just painful to look at. It also suffers from gamma problems that all but preclude true black from ever being rendered. Overall, I got so tired of looking at it that I decided to investigate whether the PC port of KOTOR was still available. And that, of course, led me to Steam. After some hemming and hawing, I finally decided to spend the $9 and give the PC version a try. It’s about as close to a Star Wars / Battlestar crossover as I ever want to see, frankly. To my embarrassment, however, despite KOTOR being one of the greatest Star Wars games ever made, I never finished it. Nor did I ever even play the sequel, despite having a copy of it collecting dust on my shelf for the last several years (I picked it up in a buy-one-get-one sale at Gamestop a long time ago). Since I’ve been in a Star Wars mood lately, having added all the movies to my Netflix queue and all, it seemed like a good time to take care of both of those problems. Unfortunately, if you were expecting the PC version of KOTOR 2: The Sith Lords to also be simply a Steam purchase away, you’ll be disappointed: only the first game is available on Steam. Additionally, the PC port of KOTOR 2 was done by a different company and was apparently so bug-riddled as to be almost unplayable. It looks like I’ll be sticking with the Xbox version for that one, assuming I ever get around to it. Carth: You know, Bastila, you sound just like this Shepard chick that I used to date. July 15th, 2010, meanwhile, has been an excellent day in many regards. I received another positive annual review from my boss, who even gave me a 5% raise. On the home front, we have another house showing scheduled for tomorrow afternoon, and traction continues to build on our real estate venture since our price-cutting competition went off the market. Hell, even BP managed to get the damn oil spill capped, at least for now. Both Apple and I have been recently casting our eyes toward the future with renewed vigor and hope, and with a little luck and a lot of patience, we’ll get there — and achieve everything we’ve worked for. Despite all of the world’s injustices, hard work does still tend to pay for itself, in at least some ways. So if you’re bored and looking to celebrate something, dust off your old copy of Star Wars: Knights of the Old Republic (or head over to Steam for a new copy on the cheap), sit back and enjoy one of the finest video game gems of the last decade. Now, if only BioWare would make a KOTOR 3 using the Mass Effect engine. A gamer can dream. Ironically enough, my KOTOR experience was the opposite of yours — I had the PC version first (back when I was a PC dude), then picked up the Xbox version later. Of course, the Xbox version is somewhat incomplete without an Xbox Live subscription — there was a later patch that added some new stuff in that’s not in the original Xbox version. KOTOR 2 is a decent game, but was quite obviously rushed out the door, as there are plot threads left unresolved, places hinted at that you’ll never see, and some other stuff. I guess there is a group out there that took all the unused stuff (which is still on the game disc, just not used) and put out their own patched PC version that tries to adhere more closely to what the developers originally wanted (i.e. what they would have done had they not been forced to rush release KOTOR 2 in time for Christmas 2004). And while I would love to see KOTOR 3 on a 360 with the Mass Effect engine (especially since the second game ends on an open note), I believe it’s already been announced that the next KOTOR game will be a (yawn) MMMMOROEORPERRPG. Ah, that’s right, you would have done the PC version first. Is it true that the DLC content offered on the Xbox platform is built into the PC version? I’m having trouble finding out for sure. It is no longer possible to get classic Xbox DLC or play those titles online since Microsoft shut down the old XBL servers a couple months ago. Wow, I didn’t realize that the sequel was that bad of a rush job. But I’m very intrigued about the fan-made restoration project. Finding a copy of the game to experiment with would be the tricky part, though I’m sure it’s possible. 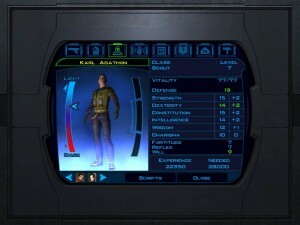 Ohhh…is this much-vaunted “Star Wars: The Old Republic” MMORPG a spiritual successor to KOTOR? That makes me even more disappointed that it’s an MMO. I just don’t dig that genre. Not even Star Trek could save it with STO, though granted I have no doubts that BioWare could pull it off with much more flair than Cryptic did. Also, the Star Wars universe somehow seems more conducive to MMO play. The Trek universe and canon is too orderly. It’s been over five years since I last played KOTOR on the PC, but I’m almost positive the DLC content comes on-disc for the PC version. I seem to recall it being that way, at least. And of course, when I got the Xbox version I didn’t have a Live subscription, so I never got the DLC for the Xbox version. Then again, all the DLC adds is a small planet with a shop and a dude to play Pazaak with (and if you beat him it opens up some powerful armor and the most powerful lightsaber crystals in the game), so it’s not really that big a deal. Yeah, I don’t know much about the KOTOR 2 restoration project, only that it exists (by that time I had moved away from PC gaming almost entirely). Beyond the missing stuff, KOTOR 2 has other problems — like the influence system, which is kind of borked. You can influence your allies to become light or dark with you — and many of them you can train to be Jedi — but their responses to your actions are hard-coded. So, say, even if a former Sith is your Jedi disciple, they’ll respond negatively to good actions, and vice-versa, no matter their alignment. Finally, yes, Star Wars: The Old Republic is being developed by BioWare, and supposedly takes place some time after the events of KOTOR and KOTOR 2, and thousands of years before the films.